On July 17, 1984, Congress passed the National Minimum Drinking Age Act. The bill would force all states to raise their drinking age from 18, 19, or 20 to 21. States that did not choose to raise their drinking age to 21 would risk losing 10% (Changed to 8% in 2012) of federal highway funding as a penalty. As of July 1988, all 50 states and the District of Columbia had a minimum purchase age of 21, with some grandfather clauses, and with the exception of Louisiana's complicated legal situation that was not resolved until July 2, 1996. Prior to 1988, the minimum purchase age varied by jurisdiction. After Congress passed the Act, states not in compliance had a portion of their federal highway budget withheld. South Dakota and Wyoming were the final two states to comply, in mid-1988. However, most states continue to allow those under 21 to drink in certain circumstances. Examples are some states like Tennessee and Washington, which allow those under 21 to drink for religious purposes. States including Oregon and New York allow those under 21 to drink on private non-alcohol selling premises. U.S. military reservations are exempt under federal law from state, county, and locally enacted alcohol beverage laws. Class Six stores in a base exchange facility, officers' or NCO clubs, as well as other military commissaries which are located on a military reservation, may sell and serve alcohol beverages at any time during their prescribed hours of operation to authorized patrons. [i] While the installation commander is free to set the drinking age, with some exceptions, most stateside military bases have a drinking age that mirrors the local community. Individual states remain free to restrict or prohibit the manufacture of beer, mead, hard cider, wine, and other fermented alcoholic beverages at home. Homebrewing beer became legal in all 50 states in 2013 as the governor of Mississippi signed a bill legalizing homebrewing on March 19, 2013 and as the governor of Alabama signed a bill legalizing homebrewing of beer and wine which came into effect on May 9, 2013. The Mississippi bill went into effect July 1, 2013. Most states allow brewing 100 US gallons (380 L) of beer per adult per year and up to a maximum of 200 US gallons (760 L) per household annually when there are two or more adults residing in the household. Because alcohol is taxed by the federal government via excise taxes, homebrewers are prohibited from selling any beer they brew. This similarly applies in most Western countries. In 1979, President Jimmy Carter signed into law a bill allowing home beers, which was at the time not permitted without paying the excise taxes as a holdover from the prohibition of alcoholic beverages (repealed in 1933). This change also exempted home brewers from posting a "penal bond" (which is currently $1000.00). Production of distilled alcohols is regulated at the National level under USC Title 26 subtitle E Ch51. Numerous requirements must be met to do so and production carries an excise tax. Owning or operating a distillation apparatus without filing the proper paperwork and paying the taxes carries federal criminal penalties. Alaska No 8 a.m. – 5 a.m., except election days (liquor stores may not open until polls close) No (although many grocery stores have separate areas that sell all forms of alcoholic beverages and many bars sell packaged liquor as well) 21 21 Exception: Underage drinking allowed for medical purposes, and on private non-alcohol selling premises with parental consent  Most communities have more restrictive laws, ranging from restrictions on operating hours to bans on sale and possession. Sellers/servers may not, for any reason, give a person alcohol for free or sell it for less than its cost. Sellers/servers may drink while on duty, but no intoxicated person may remain on the premises, so an impaired server could be arrested. Yes 21 21 Exception: Underage drinking allowed for religious and medical purposes Sales of any type of alcohol are legal at any store that has an off-premises liquor license, including but not limited to convenience stores and grocery stores. Bars may sell closed containers of alcohol for consumption off the premises. Drive-through liquor stores are allowed. Everclear Grain Alcohol Proof 190 (95% alcohol) is legal. A large percentage of the land area of Arizona is in Indian reservations, many of which have liquor laws considerably more restrictive than state law, up to and including total prohibition. "Beer busts" (all the beer/liquor one can drink for a set price) in bars are illegal. Persons 18 years of age or older may work in bars and liquor stores serving and selling alcohol. Patrons may not purchase for on premises consumption more than 50 ounces of beer, 1 liter of wine or 4 ounces of distilled spirits at one time. DUI penalties are some of the most severe in the nation. A person convicted of a DUI (even first offense) must have an interlock installed in his car for one year. Arizona has an 'Impaired to the Slightest Degree' law that can convict a person even if his BAC is less than .08%. California No 6 a.m. – 2 a.m. Yes 21 21 Exception: A minor will not be penalized for consuming alcohol if discovered or reported through a medical emergency. Relatively unrestricted; beer, wine and liquor available at grocery stores, convenience stores, gas stations, and warehouse clubs. No statewide holiday restrictions. Motor vehicles entering from Mexico may only import 1 liter of alcohol (duty-free). Sale or distribution of alcoholic beverages higher than 60% ABV is illegal (B&P 23403). 18-, 19- and 20-year-old wine and beer production students can taste—but not consume—what they are making and studying. Yes No* 21 21 Exception: Underage consumption allowed on private non-alcohol selling premises with parental consent, for religious, medical, and educational purposes. Spirituous, vinous & malt liquor available in liquor stores and liquor-licensed drug stores only. 11 a.m. – 1 a.m. (Sun.) 8 a.m. – 10 p.m. (Mon.–Sat.) 10 a.m. – 6 p.m. (Sun.) Yes No 21 Exception: No explicit age if a present legal guardian is 21 or older 21 Exception: Underage consumption is allowed on private non alcohol selling premises with parental consent, for medical and religious purposes, and on alcohol selling premises with parental consent. Sunday off-premises sales allowed as of May 20, 2012; Sunday on-premises sales subject to local ordinances. noon–8 p.m. (Sun.) Municipalities with a population over 50,000 persons may impose stricter hours of sale by local ordinance. No 21 21 Exception: A minor will not be penalized for if discovered consuming alcohol through a medical emergency. Underage drinking allowed on private non-alcohol selling premises with parental consent, for religious purposes. For off-premises consumption, alcohol may be purchased only in a liquor store, taproom, or a brew pub that has an off-premises license. Unless accompanied by a parent or guardian over 21, no person under 21 may enter a liquor store or taproom for any reason, even for the intent of purchasing only tobacco or lottery tickets. No sales of alcohol by liquor stores or taprooms are permitted during designated holidays including Thanksgiving, Easter or Christmas. Yes No 21 21 Exception: A minor will not be penalized for if discovered consuming alcohol through a medical emergency. *Liquor stores can begin applying for licenses to open on Sunday as of January 16, 2013. No singles sold, but stores in some areas may apply for an exemption. The day before a federal or district holiday, on-premises retailers may sell/serve from 8 a.m.-3 a.m. On New Yer's Eve, on-premises retailers may sell/serve until 4 a.m. on January 1. Georgia No Hours of sale determined by local jurisdiction. No alcohol sales on Christmas Day. Yes No 21 21 Exception: Underage drinking allowed on non-alcoholic premises with parental consent, and for religious and medical purposes. 14% ABV cap on beer. Sunday off-premises sales from 12:30 p.m. to 11:30 p.m. allowed only by local referendum. 8 a.m. – 2 a.m. Sun Yes If a controlled substance is detected in a person's system at or near the time they were operating a motor vehicle, they can be charged and potentially convicted of operating while intoxicated (OWI) even if they were not "impaired" by that substance. Maine No Yes 6 a.m. to 1 a.m. (Mon–Sun) Yes  21 21 ABV > Alcohol may not be purchased after 1 a.m. any day of the week, may not be purchased prior to 6 a.m. Bars and restaurants may serve until 1:15 a.m. On New Year's Day alcohol may be sold one hour later in all establishments. Wholesaling through state-licensed monopoly. Municipalities may prohibit the sale of alcohol by referendum; 56 towns have done so. Massachusetts No 8:00 a.m. – 2:00 a.m. by state law, although individual cities and towns may prohibit sales before 11:00 a.m. and after 11:00 p.m. Not before 11:00 a.m. on Sunday. 8:00 a.m. – 11:00 p.m., or 8:00 a.m. – 11:30 p.m. on the day before a holiday. Not before 10:00 am on Sunday. Yes. 21 21 As of January 2016, no individual, partnership, or corporation may have more than seven off-premises licences in the state, nor more than two in any city, nor more than one in any town. No individual, partnership, or corporation not resident or headquartered in Massachusetts may apply for a license, although one may devolve thereupon. As of 2012-10-29, a Massachusetts driver's license, Massachusetts Liquor ID card, RMV-issued Massachusetts non-driver ID card, passport (issued by the US or a US-recognized foreign entity), US-issued Passport Card, and military identification card are the only acceptable proofs of age under state law. Out of state or Canadian driver's licenses/ ID's and other forms of identification do not grant the establishment legal protection if accepted as proof of age (and many establishments will not accept out of state licenses for this reason). On-premises regulations: No discounts at specific times (i.e. no "Happy Hour" discounts) or for specific individuals, no fixed-price open bar or all-you-can-drink (except at private functions), no more than two drinks per individual at any one time, no pitchers for fewer than two people, no drinking contests, no drinks as prizes, no free drinks. Off-premises sale of alcohol is prohibited on the last Monday in May (Memorial Day), Thanksgiving Day, Christmas Day, and the day after Christmas if Christmas falls on a Sunday. Sale of alcohol is prohibited during polling hours on election days (subject to local exceptions). "Malt beverages" defined as having not more than 12% alcohol by weight. Yes 21 21 The Michigan Liquor Control Commission allows the sale of alcoholic beverages until 11:59 p.m. on December 24 and after 12:00 p.m. on December 25. On-premises sales are permitted on January 1 until 4:00 a.m. Local or county ordinance may restrict Sunday or Sunday morning sales. State does not operate retail outlets; maintains a monopoly over wholesaling of distilled spirits only. State owns liquor until purchased and distributor acts as a delivery service for cases sold to retailers. 3.2% Only No Local or County ordinance prevails for hours of operation for off-sale licenses. Growler sales allowed until 10 p.m. 7 days a week. Certain municipalities may establish municipal liquor stores; they are permitted, but not required, to exclude privately owned stores. Off-premises sales on Sundays became legal on July 1, 2017. Mississippi No Yes Local authorities fix hours of alcohol sale Yes No ABW > 5% wine and sparkling wine sold in state-contracted stores which are open from 10:00 am until 10:00 pm (Closed Sundays) statewide. Beer and light wine (ABW < 5%, ABV < ~6.3%) sold in convenience stores/supermarkets. Beer and light wine (ABW < 5%) may be consumed by persons age 18-20 with parental supervision. Governor Phil Bryant signed a bill permitting beer with 8% ABW/10% ABV on April 9, 2012. The bill went into effect on July 1, 2012. Liquor control law covers all beverages containing more than 0.5% alcohol, without further particularities based on percentage. Cities and counties are prohibited from banning off-premises alcohol sales. Special licenses available for bars and nightclubs which allow selling alcohol until 3:00am in Kansas City, Jackson County, North Kansas City, St. Louis, and St. Louis County. Grocery stores, drug stores, and even gas stations may sell liquor without limitation other than hours. Patrons allowed to take open containers out of bars in Kansas City's Power & Light District. Parents and guardians may furnish alcohol to their children. 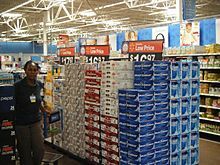 Missouri law recognizes two types of alcoholic beverage: liquor, which is any beverage containing more than 0.5% alcohol except "non-intoxicating beer"; and "non-intoxicating beer," which is beer containing between 0.5% and 3.2% alcohol. Liquor laws apply to all liquor, and special laws apply to "non-intoxicating beer." Montana No Yes Closing 2am No alcohol sales between 2 am and 8 am Yes Distilled spirits cannot be sold in grocery stores 21 Minors can consume alcohol purchased by a parent or guardian in a private location. ABV > 16% wine sold in state-contracted stores, ABV < 16% may be sold in grocery stores. Some local ordinances restrict alcohol sales on Sundays. State run liquor stores are closed on Sundays. Nebraska No 6 a.m. – 1 a.m. Legislation passed in 2010 allows for municipalities to extend on-premises sales to 2 a.m. with two-thirds approval of city or county councils. Yes No on- or off-premises sales of spirits before noon on Sundays. All beer, wine, and champagne can be sold starting at 6 a.m.
Nevada No 24 hours Yes There are few restrictions on the sale and consumption of alcohol in Nevada except for age. The maximum abv of alcohol sold is 80%. State law also renders public intoxication legal, and explicitly prohibits any local or state law from making it a public offence. Alcohol purchase is only controlled in Panaca. New Jersey No Each municipality can control hours by local ordinance. Most municipalities have a last call of 2 or 3 a.m. Atlantic City, Brigantine, Absecon, Elwood, Pomona, Smithville, Galloway, and Mullica (All in Atlantic County) serve 24 hours. There are some dry towns in the southern part of the state, including Ocean City. 9 a.m.-10 p.m. for liquor. Beer and wine can be sold at any time on-premise sales are permitted in that municipality. This causes most liquor stores to close at 10 PM, however some will stay open an hour later selling only beer and wine. Cities of the first class (e.g. Jersey City and Newark) are exempt from this law and may set their own hours for liquor sales. Rarely 21 21 (unless provided by parent or guardian in private) Some dry communities in historically Methodist and Quaker communities in the southern part of the state. New Mexico No 7 a.m. – 2 a.m., except Sundays, for establishments with full dispenser license. 7 a.m. – midnight except Sundays Yes New Mexico issues two types of license for consumption on-premises: a full dispenser license allowing sale of all types of alcohol, or a restaurant license permitting sale of beer and wine only. An additional Sunday permit is available which allows sale (on or off premises) on Sundays from noon until midnight. Exceptions are the prohibition of alcohol sale on Christmas, regardless of the day it falls on, and a Sunday permit allowing of sale (on or off premises) until 2:00 a.m. January 1, if December 31 falls on a Sunday. Sunday permits are only available where approved by voters within a local option district. Selling, serving and giving alcohol to a minor is a class 4 felony punishable by up to 18 months in prison, except when "a parent, legal guardian or adult spouse of a minor serves alcoholic beverages to that minor on real property, other than licensed premises, under the control of the parent, legal guardian or adult spouse", or for religious purposes. Noon – 9 p.m. (Sun). Yes No 21 Off-premises sale of wine and spirits is only at liquor stores, and beer is not sold at liquor stores; it must be sold at supermarkets and convenience stores. Exchanges for returned items are permitted (at store owners' discretion). Liquor: 9 a.m. – 9 p.m. (Mon – Sat) Yes No 21 15% ABV cap on beer, 16% cap on unfortified wine, 24% cap on fortified wine. No "happy hour," "buy one get one free," or "ladies night" style specials allowed. Yes, under 21% ABV 21 21 or older, unrestricted under supervision of individual's parent or legal guardian or legal age spouse 12% ABV cap on beer was removed on May 31, 2016. 21% ABV cap on wine. No intoxicating liquor shall be handled by any person under twenty-one years of age, except that a person eighteen years of age or older employed by a permit holder may handle or sell beer or intoxicating liquor in sealed containers in connection with wholesale or retail sales, and any person nineteen years of age or older employed by a permit holder may handle intoxicating liquor in open containers when acting in the capacity of a server in a hotel, restaurant, club, or night club. . Beverages with less than 0.5% ABV can be sold/given to people under the age of eighteen if given by a physician in the regular line of his practice or given for established religious purposes, or the underage person is accompanied by a parent, spouse who is not an underage person, or legal guardian. Oregon No Yes 7 a.m. – 2:30 a.m. 7 a.m. – 2:30 a.m. Yes No 21 Liquor, all of which is state-owned prior to sale to consumers, is sold in private liquor stores. These stores are approved by Oregon's Liquor Commissioners to act as sales agents on the state's behalf. Special permits may be purchased for certain organizations for fundraisers once per calendar year, and are valid for a total of six days under the same rules governing restaurants. Grain alcohol prohibited as a beverage. 10 a.m. – 6 p.m. (Sun) No 21 21 All alcohol may be sold only in liquor stores. No off-premises alcohol sales after midnight Saturday until 7 a.m. Monday, except in Aiken, Greenville, Pendleton, Spartanburg, Horry County, Colleton County, Richland County, Charleston County/city, Beaufort County, York County, and Newberry County. Wine & Spirits: 8 a.m. to 11 p.m. Mon–Sat, 10 a.m. to 11 p.m. Sun Yes No 21 Wine may be sold in grocery stores. Liquor stores may remain open on Sundays, and liquor is permitted to be sold from retail stores for off-premises consumption.There are no liquor sales in OFF Premise Grocery Stores as of 8/2018. Retail package stores must be closed for business on Christmas, Thanksgiving Day, and Easter. Beer above 8% ABW /10.1% ABV must be sold in liquor stores. Open container law only applies to drivers, not passengers. It is legal to carry alcohol in a non-glass container on the Beale Street stretch in Memphis. While most clubs allow drinks to be carried outside, many do not allow drinks from outside. An alcoholic beverage served (on-premises) to a customer between 10 a.m. and noon on Sunday may only be provided during the service of food to the customer. Eleven Texas counties are completely dry. In many counties, public intoxication laws are vigorously upheld. Texas law permits consumption by minors (any age under 21) if in the "visible presence" of a parent, guardian or adult spouse. (Section 106.04) Possession by minors is permitted as part of employment or education, or in the visible presence of an adult parent, guardian or spouse, or supervision of a commissioned peace officer. (Section 106.05) There are also exemptions for minors requesting or receiving medical attention. Vermont No Yes 8 a.m. – 2 a.m. 6 a.m. – midnight Yes No 21 ABV > 16% beer and ABV > 16% wine are only available through state liquor stores (most of which are integrated within grocery and beverage stores). A 2008 bill allows the sale of beer in grocery and convenience stores up to ABV 16%.